[Satnews] During the evening of October 20, the global satellite navigation community gathered at the ddb forum in Berlin to recognize this year's most brilliant innovations in commercial applications of satellite technology via the European Satellite Navigation Competition (ESNA). The project POSEIDRON won over the international jury of experts with its remote-controlled multicopter built to support maritime search-and-rescue services—and took home the grand prize ahead of the European Satellite Navigation Competition's 29 other winners. Mr. Enrique Martínez Asensi and his winning team hope to see POSEIDRON save lives far out at sea when people fall overboard or are involved in shipwrecks that occur during illegal immigration. Custom-developed by Sincratech Aeronautics—a start-up based in Valencia, Spain—POSEIDRON can be launched from ships or platforms under virtually any weather conditions. The multicopter uses thermal cameras and the European positioning service EGNOS to quickly locate people in the water and transmit an alarm to rescue teams along with precise information. Capable of carrying up to 70 kg, the unit can also transport a dinghy and deploy it as soon as casualties are found. This is what makes POSEIDRON both faster and more cost-effective than other rescue systems, which in turn significantly increases the chances of survival, particularly in cold waters. ESNC winners: Thorsten Rudolph, Ulrike Daniels (both Anwendungszentrum GmbH), David Argiles (ValSpace Consortium), Rudesindo Hernando Meliá, Maria Dolores Albiol Simo, Manuel Pedreira Gimenez, Jorge Esteve Ripollés and Enrique Martínez Asensi (all Sincratech Aeronautics) and Dorothee Bär (German Federal Ministry of Transport and Digital Infrastructure (BMVI)). Photo is copyright Anna Kreuz. In addition to winning the ESNC's 20,000 euros grand prize, this innovative project will now have the chance to enter a 12-month incubation program at one of five Science Parks in Valencia as part of the region's prize. The ESNC set another new participation record this year, with 515 innovations entered by companies from more than 40 different countries around the world. The competition thus more than matched the successes of editions past in increasing its overall figures to 272 winners awarded and 3,343 ideas received from over 10,000 participants throughout its 12 years in existence. Under the patronage of the German Federal Ministry of Transport and Digital Infrastructure (BMVI), the ESNC presented prizes valued at approximately 1 million euros in total at its festive Awards Ceremony. The competition's jury of some 240 renowned experts selected both the overall victor and 30 other regional and special prize winners. With their innovations in areas such as connected mobility, smart cities, tourism, and environmental protection, these entrants demonstrated how fundamental precise satellite navigation signals are to Europe's digital society. 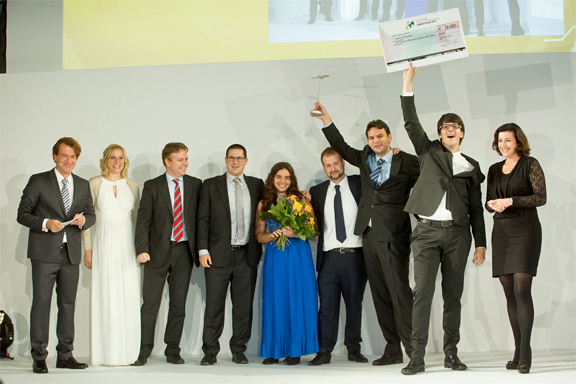 Please visit the ESNC website for an overview of this year's winners. "For the German Federal Government, the digitalization of the economy and society at large is one of the most crucial endeavors of all, and satellite-based services are becoming a more and more important part of the process. Through this European competition, we want to support innovative companies in turning their ideas into market-ready products. Today, I'm delighted to have the opportunity to provide this start-up assistance to this year's winners. As many of their predecessors have shown in years past, they will now have excellent chances to enter the market with their winning applications." "Time synchronisation and reliable positioning information are essential to today's digital economy: Without corresponding satellite-based services, the development of these and other innovations - including the Internet of Things, machine-to-machine communication, and Industry 4.0—would not be possible," said Thorsten Rudolph, CEO of ESNC initiator and organizer Anwendungszentrum GmbH Oberpfaffenhofen. "As the ideas submitted to this year's ESNC have shown to impressive effect, it is these forward-thinking technologies in particular that present a great deal of potential waiting to be unleashed by high-tech start-ups."